What Is DA Form 200? 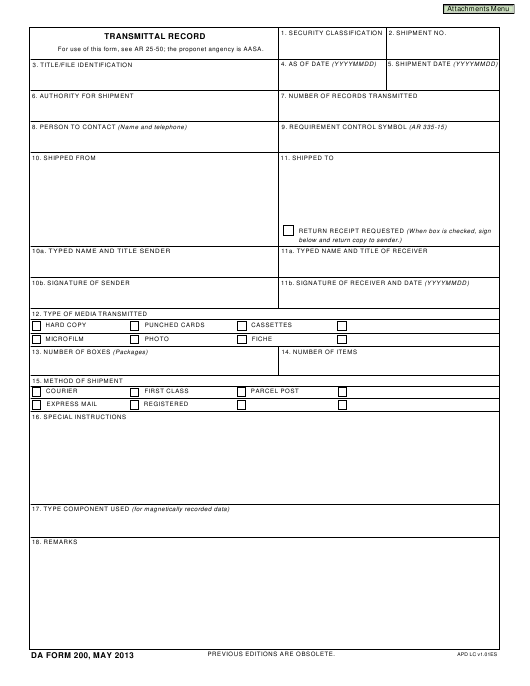 DA Form 200, Transmittal Record is an official form issued by and used within the United States Army in order to keep a track of transmittal records of Army property shipped from a receiving party to a shipping party. The form is a medium for systematizing and describing the details of every delivery. The Army-released form should not be confused with the DD Form 200, Financial Liability Investigation Of Property Loss, used during investigations of financial responsibility for the loss of Military property. The present version of the DA Form 200 was issued by the Department of the Army (DA) on May 2013 with all previous editions obsolete. An up-to-date blank DA 200 fillable form is available for download below. The form can also be found on the Army Publishing Directorate website or can be requested through the chain of command. When Do I Use DA Form 200? Individuals need to use the DA 200 Form when preparing to send any media that is the property of the U.S. Army to any addressee. The transmittal record is made to help specify all details regarding the dispatch of Army property and its delivery to the recipient and is filled in by the sender. 1. SECURITY CLASSIFICATION 2. SHIPMENT NO. For use of this form, see AR 25-50; the proponet angency is AASA. Indicate the security classification in Box 1 in order to determine the shipment method and the adequate security measures. Provide the shipment number in Box 2. The shipment date and identification are entered in Boxes 3, 4 and 5. Boxes 6 through 11 are intended for the authorization of the shipment, the number of records sent, the name and phone number of the person to contact, and the information about the transmitter and the recipient. If you need a return receipt, it can be requested in Box 11. In this case, the DA 200 will be signed, copied, and sent back by the recipient. Use Boxes 12, 13 and 14 to indicate the type of media sent, its form, and the number of boxes and items in the shipment. Box 12 provides a list of the different types of media. If you cannot find the type you need, you can enter a custom type in blank space provided below the list. The shipment method and shipping instructions along with any special details should be entered in Boxes 15, 16 and 17. The last box on the form is meant for any additional data not included in the previous sections. After the form is properly completed and the media is sent, both the sender and recipient must keep their own copies of the DA Form 200 for recording purposes.